i think type 1 came out really great, my boyfriend preferred type 2, but he is kind of pear-obsessed. I think the key is to lay low on the sugar, add lots of fresh lemon juice, and combine sweet and tart fruits. Next I will try peaches and rhubarb (though rhubarb is apparently struggling this year, I've had a hard time getting it). I nearly triple the fruit portion, and use a variety of fruits instead of just peaches. I triple the amount of lemon juice. I leave out the sugar entirely for the fruit part. I leave the biscuit topping as is (it is a fantastic recipe), but i double it to get more, since i tripled the fruit portion. 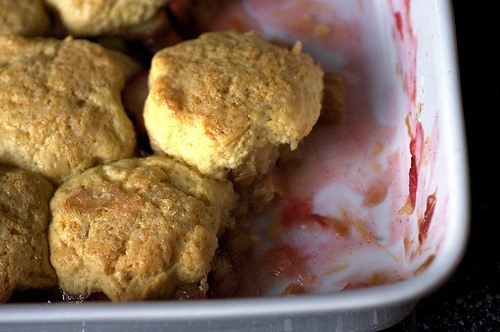 i'd love to hear any suggestions or subtractions/addendums from any of you... or great cobbler recipes you may have. Happy prime farmer's market season!